Salt marshes are ecosystems that occur along much of the coast of New England in the United States. Salt marshes are very important – they serve as habitat for many species, are a safer breeding location for many fish, absorb nutrients from fertilizer and sewage coming from land and prevent them from entering the ocean, and protect the coast from erosion during storms. Unfortunately, rising sea levels are threatening these important ecosystems. Sea level is the elevation of the ocean water surface compared to the elevation of the soil surface. Two processes are causing sea levels to rise. First, as our world gets warmer, ocean waters are getting warmer too. When water warms, it also expands. This expansion causes ocean water to take up more space and it will continue to creep higher and higher onto the surrounding coastal land. Second, freshwater frozen in ice on land, such as glaciers in Antarctica, is now melting and running into the oceans. Along the New England coast, sea levels have risen by 0.26 cm a year for the last 80 years, and by 0.4 cm a year for the last 20 years. Because marshes are such important habitats, scientists want to know whether they can keep up with sea level rise. When exploring the marsh, Anne, a scientist at the Plum Island Ecosystems Long Term Ecological Research site, noticed that the salt marsh appeared to be changing over time. One species of plant, salt marsh cordgrass (Spartina alterniflora), appeared to be increasing in some areas. 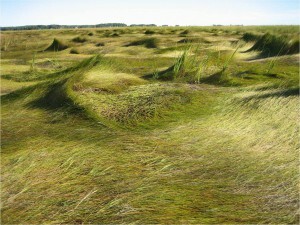 At the same time, some areas with another species of plant, salt marsh hay (Spartina patens), appeared to be dying back. Each of these species of plants is growing in the soil on the marsh floor and needs to keep its leaves above the surface of the water. As sea levels rise, the elevation of the marsh soil must rise as well so the plants have ground high enough to keep them above sea level. Basically, it is like a race between the marsh floor and sea level to see who can stay on top! Anne and her colleges measured how fast marsh soil elevation was changing near both species of plants. 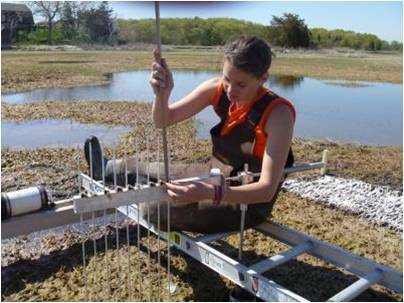 They set up monitoring points in the marsh using a device called the Sediment Elevation Table (SET). SET is a pole set deep in the marsh that does not move or change in elevation. On top of this pole there is an arm with measuring rods that record the height of the marsh surface. The SETs were set up in 2 sites where there is salt marsh cordgrass and 2 sites where there is salt marsh hay. Anne has been taking these measurements for more than a decade. If the marsh surface is rising at the same rate as the sea, perhaps these marshes will continue to do well in the future.